Taiwan has a comprehensive semiconductor industry cluster and is the world's densest and most technologically advanced semiconductor production base. Semiconductor manufacturing has been listed as a key industry for national development with the aim of upgrading the industry, achieving an innovative economy, and grasping developmental opportunities in the digital age. Semiconductor chips are the common foundation on which the 5+N innovative industries are based. 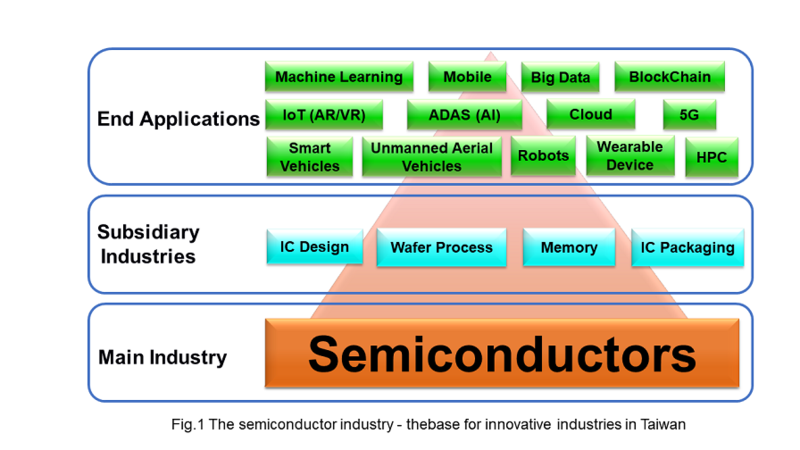 As the link that connects the 5+N innovative industries with the IoT, they require chip design and semiconductor technologies. Taiwan hopes to guide the semiconductor industry in expanding from consumer electronic products into cooperation in innovative industries such as green energy, smart machinery, agriculture, biomedicine, and electric vehicles. Semiconductors, therefore, are listed among the 10 major industries in the 2018 industrial innovation R&D plan. Traveling within Taiwan is very convenient. It takes only 90 minutes to travel from the north to the south by High Speed Rail, facilitating prompt technical support. 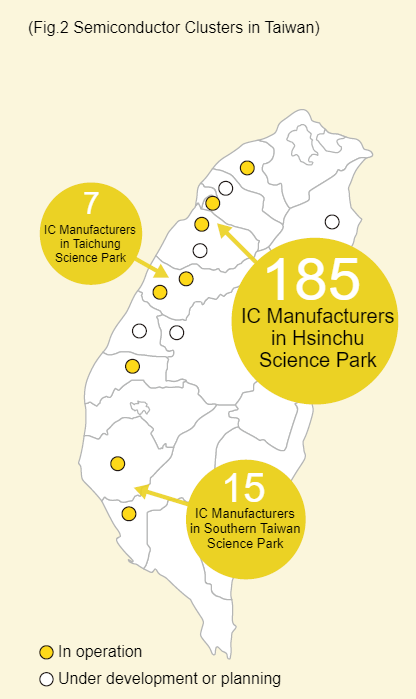 Taiwan has a complete upstream-downstream IC industrial chain that reaches from upstream IC design through IC manufacturing to final IC packaging and testing, in a professional division of labor model that is unique in the world. 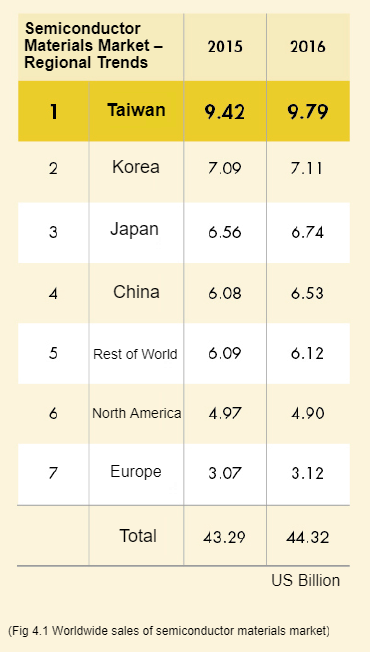 Taiwan ranks second globally in total IC production value, after only the USA (and ahead of Korea and Japan). Furthermore, a comprehensive chain of interconnected industry clusters stretching from Hsinchu to Taichung and Tainan facilitates the joint development of advanced processes. 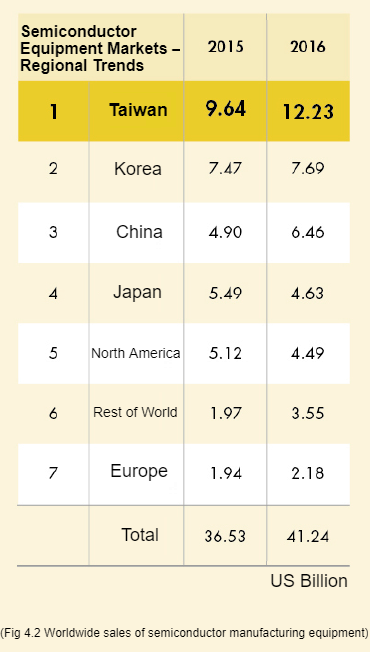 Taiwan ranks number one globally in OEM wafer production, with advanced process technologies that have entered the 14 nm and 10 nm realms and solidify the island's standing as a world leader. Taiwan's IC packaging and testing industry also ranks number one, with more than half of the world's top-10 IC packaging and testing companies. Years of development have fostered a great number of dedicated professionals with mature technology, making it easier for international companies to develop their business and establish positions of world leadership in Taiwan. Taiwan's IC industry continues to invest resources in R&D, enabling it to lead global semiconductor technology to new heights of achievement. In addition to establishing autonomous semiconductor technologies, the industry is able to shorten the lead time for the mass production of high-tech semiconductor products through the international technological cooperation model. Taiwan has as many as 300 IC manufacturers, and their total procurement of semiconductor materials was worth US$10.3 billion in 2017. Taiwan has been the top buyer of semiconductor materials in the world for eight consecutive years, and its demand for new materials and equipment will grow continuously as its IC production continues to expand. The high-end photoresists, metal targets, film coatings, and special process reaction gas currently used in Taiwan's IC production, as well as wire binding, sealing materials, and filling plastic for IC packaging, are all imported. IC manufacturers hope that international suppliers will come and produce these materials in Taiwan so as to reduce their supply risk. Furthermore, 10nm IC processing will soon enter mass production in Taiwan, creating more demand for high-end materials for both IC production and packaging. Taiwan hopes to strengthen cooperation with international manufacturers in supplying this demand. Taiwan is the location of major global wafer foundries and advanced packaging and testing services. Their procurement of new equipment reached a value of US$11.49 billion in 2017, making Taiwan the world's second top buyer, and from 2011-2016 Taiwan was the world's top buyer of new semiconductor equipment for five years in a row. (1) Preliminary process facilities: Film deposition control technology, etching evenness control, and DUV exposure laser source technology. (2) Advanced packaging process equipment: Photo resist coating technology, copper plating technology, laser cutting technology. In the field of semiconductor equipment, there are ASML of Holland and Applied Materials Inc. and Lam Research of the USA, which have established R&D centers or talent incubation HQs in Taiwan. In the field of electronic materials there are Hsin-Etsu Chemical and Tokyo Ohka Kogyo of Japan and DOW Chemical Company and Cabot Microelectronics of the USA, which have established new plants or expanded operations in Taiwan to meet customer demand.